Two Ferrari 250 GT cars and the most-expensive Porsche ever lead the results of the highest prices paid at the 2015 Gooding Pebble Beach auction. A 1961 Ferrari 250 GT SWB California Spider sold for $16,830,000 while a 1962 Ferrari 250 GT SWM Berlinetta Speciale sold for $16,500,000 – the two best results ever at a Gooding and Company auction. The 1983 Le Mans winning car – the 1982 Porsche 956 – achieved $10,120,000 to become the most-expensive Porsche ever sold at public auction. Gooding sold 26 cars for over a million dollars at Pebble Beach 2015. 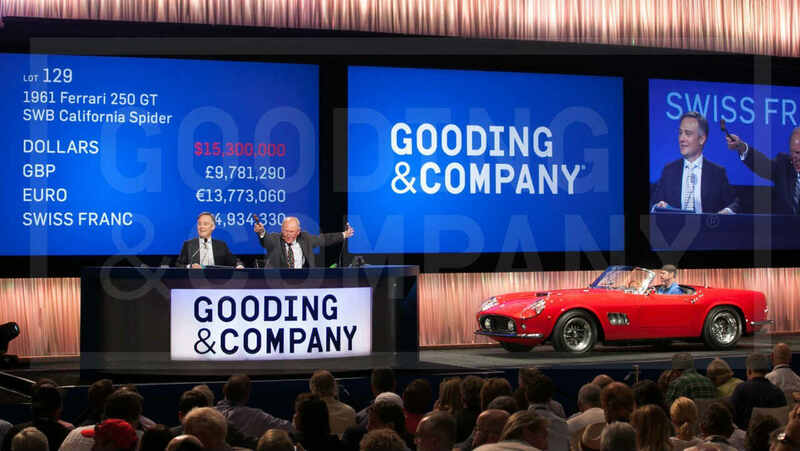 Gooding & Company set new records at the 2015 Pebble Beach auction with the two highest single lot results in the company’s history and the highest ever grossing total. 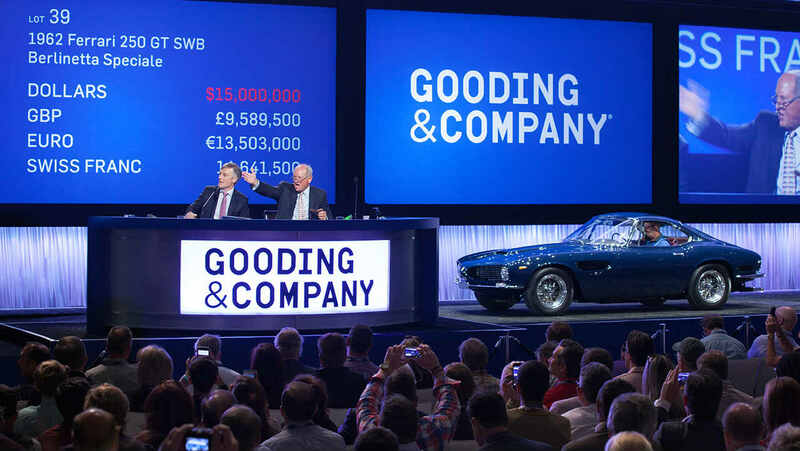 On two days of auctions, Gooding achieved a sell-through rate of 89% to earn $128 million from 115 lots sold (out of 129 offered) with 26 cars selling for over a million dollar each. In 2014, Gooding earned $106 million at Pebble Beach with 30 cars exceeding a million dollars. Before August 2015, fewer than 20 cars ever had sold for more than $10 million at public auctions. At Pebble Beach 2015, Gooding added three more including the first Porsche ever to sell for eight figures at auction. The 1961 Ferrari 250 GT SWB California Spider with coachwork by Scaglietti went into auction with the highest publishes pre-auction estimate ($16-18 million) of any car offered during the 2015 Monterey classic car week. The result of $16,830,000 was the second highest of the week – only bettered by the 1964 Ferrari 250 LM sold by RM Sotheby’s in The Pinnacle Portfolio for $17.6 million – and the highest single-lot result ever at a Gooding & Company auction. The car, in excellent condition, is one of only 37 out of 56 California Spiders with covered headlights. The car was never fully restored or shown at top events making it a particularly attractive deal for buyers interested in exhibiting at major shows. As the name indicates, the 1962 Ferrari 250 GT SWB Berlinetta Speciale is a very special Ferrari indeed. The car was designed by a young Giugiaro as the personal car of coachbuilder Nuccio Bertone, who was keen to drum up some business with Ferrari. The design was inspired by Ferrari’s shark-nose racing cars from the period but to Bertone’s disappointment, Enzo Ferrari stuck to Scaglietti and Pininfarina. The 1962 Ferrari 250 GT SWM Berlinetta Speciale with Bertone body was offered for the first time ever at public auction at Pebble Beach 2015 and the price of $16,500,000 was the third-highest result of the week. Gooding & Co set a new marque record when the 1982 Porsche 956 sold for $10,120,000 – the first time ever that a Porsche achieved over $10 million at public auction. The 1982 Porsche 956 is of course a very special car. It was the third of only 10 Works Porsche 956s built but most memorably won the 1983 Le Mans 24 Hours race outright with Al Holbert / Hurley Haywood / Vern Schuppen. The previous year, the same car was second overall while driven by Jochen Mass and Vern Schuppen. It also scored victories at Spa, Fuji, Brands Hatch and Kyalami. Further famous drivers racing the car included Jacky Ickx, Derek Bell and John Watson. The 1982 Porsche 956 was sold, not surprisingly, in the iconic Rothmans livery it wore during the 1983 Le Mans race. A 1957 Ferrari 410 Superamerica Series II Coupe sold for $5,087,500. The original owner was Princess Soraya, who kept the car after her divorce from the Shah of Iran. A 1967 Ferrari 275 GTB/4 sold for $3,877,500. This car was recently rediscovered after being in storage for four decades. The paintwork is believed to be the original. A 1965 Ferrari 500 Superfast sold for $3,025,000. It car originally belonged to Prince Sadruddin Aga Khan. A 1966 Ferrari 206 S Dino Spider sold for $2,310,000. A 1998 Ferrari 333 SP sold for $2,090,000. A Ferrari 275 GTS sold for $1,925,000. A 1961 Ferrari 250 GT Series II Cabriolet sold for $1,842,500. A 1992 Ferrari F40 sold for $1,375,000. Apart from the record-breaking Le-Mans winning Porsche 956, several further top Porsches were on offer at the various auctions during Monterey 2015 classic car week. Gooding had the best Porsches on offer and sold five for over a million (and several more for just below a million). The 1960 Porsche RS60 sold for $5,400,000 was the last of four Works Porsche RS60s built. It was raced by amongst other Stirling Moss and Graham Hill although reliability issues let it down and prevented any major victories. Gooding achieved a strong $1,732,500 on a 1988 Porsche 959 Komfort – the highest result for the four Porsche 959s on offer during the week. It is only in recent months that 959s have achieved a million dollar regularly at auctions and this strong result is sure to encourage more owners to test the market. Values of 959s are helped by the 25-year rule, which allows it to be registered in many parts of the USA – but not California – without many of the safety and emission standards required from newer vehicles. A 1967 Porsche 906 E in Sebring racing livery sold for $1,650,000. Gooding had three 1973 Porsche 911 Carrera 2.7 RS cars in the 2015 Pebble Beach auctions with estimates around a million dollar. However, it was the 1975 Porsche 911 Carrera 3.0 RSR (estimate $700,000-$900,000) that comfortably broke the million-dollar mark when it achieved $1,292,500. (The other three sold in the mid-$900,000). Two 1955 Mercedes Benz 300 SL Gullwings were on offer selling for $1,650,000 and $1,595,000 respectively. These prices were at the top end of results at recent auctions for Gullwings. The Roadsters are more practical than the Gullwing Coupes and often achieve higher prices at public auctions. However, at the 2015 Pebble Beach auction the results were reversed. The 1960 Mercedes Benz 300 SL Roadster sold for $1,210,000 while the 1959 Roadster achieved a more modest $1,100,000. A 1927 Bentley 6 ½ Litre Le Mans Sports sold for $1,210,000 (estimate $800,000 – $ 1,200,000). A 1939 Lagonda V-12 Rapide sold for $1,650,000 (estimate $1.1 – 1.5 million). A 1934 Packard Twelve 1108 Sport Sedan sold for $3,630,000 (estimate $2-$3 million). A 1934 Rolls Royce Phantom II Continental Sedanca Drophead Coupe sold for $1,650,000 (estimate $0.9-$1.2 million).